Turkey-backed Free Syrian Army soldiers walk in city center of Afrin, northwestern Syria, March 18, 2018. The appeal came as looting was widely reported in the town captured a day earlier by Turkish troops and allied Syrian fighters, according to residents and monitors. Meanwhile, Turkey's state-run news agency said 11 people — seven civilians and four Turkish-backed Syrian fighters — were killed in an explosion in a building in Afrin town center as it was being cleared of booby traps. Anadolu News agency said the bomb was reportedly left by Syrian Kurdish fighters. On Sunday, Turkish troops and Syrian opposition fighters allied with Ankara marched into Afrin, nearly two months after Turkey began its offensive on the enclave. 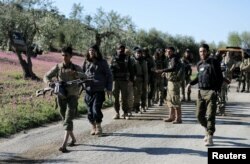 Turkey considers the Syrian Kurdish militia in Afrin a "terrorist" group and an extension of its own Kurdish insurgency within Turkey. FILE - European Union foreign policy chief Federica Mogherini speaks during a media conference after a meeting of the EU3 and Iran at EEAS headquarters in Brussels, Jan. 11, 2018. 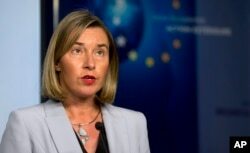 "I am worried about this," Mogherini told reporters in Brussels on Monday, in reference to Turkey's offensive in Afrin. She said that international efforts in Syria are supposed to be "aiming at de-escalating the military activities and not escalating them." Turkey views the local Kurdish militia, the People's Defense Units or YPG, as a threat to its national security and has vowed to push it out of the district and away from its borders. The YPG retreated amid the swift Turkish offensive on Afrin's town center, and vowed to start a "new phase" of fighting against the Turkish troops and allied fighters. Meanwhile, Afrin residents and the Britain-based Syrian Observatory for Human Rights reported widespread looting and pillaging soon after Turkish troops and allied Syrian fighters marched into the town center. The Observatory said the pillaging began on Sunday. Images have emerged of torched stores, men in uniforms and others in civilian clothes walking out of homes with full loads of bales, while others were seen driving away with tractors and agriculture supplies. A Syrian commander with the Free Syrian Army, which captured the district along with Turkish forces, blamed "thieves" for the looting. Moataz Raslan, a commander with the FSA, said a unit for protection of property has been formed to prevent further theft. Thousands of Afrin residents, many of whom had earlier fled from the villages near the border with Turkey to the town center, streamed out of Afrin before the Turkish troops entered. Lines of vehicles and civilians on foot headed toward Syrian government-controlled areas to the south or other Kurdish-controlled areas. Jiwan Mohamed, a doctor who worked at Afrin hospital, said the news from inside Afrin and images of looting were disturbing. The central Afrin hospital was bombed before the town center was captured, he said. The doctor said learned from contacts with those still inside Afrin that that more buildings were being burned. Azad Mohamed, an Afrin resident who arrived Sunday in a region in the east of Syria after two days on the road, said looting began even before they entered the town center, in adjacent villages. "If they have not yet stolen my things, they will in an hour," he said. "We knew they would only leave the walls." Mohamed blamed the Syrian Kurdish YPG militia for failing to help people evacuate the town earlier with their belongings. Syrian Kurdish officials have said that more than 800 YPG fighters have been killed in the 58 days of fighting for Afrin, and estimated that 500 civilians were killed. The Observatory puts the number of casualties at over 280 civilians, adding that more than 1,500 Kurdish fighters have been killed since Jan.20. Turkey says it has taken all measures to avoid civilian casualties. Turkey says 46 of its soldiers were killed in the offensive.